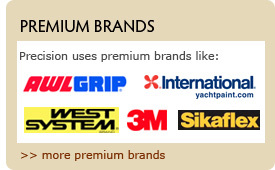 Precision Shipwright Services has it's facilities in Phuket Boat Lagoon Marina in Phuket, Thailand. With a total of 950 sqm indoor factory and workshops, additional outdoor work areas on hard stand with a new mobile painting cover (or custom made yacht covers), Precision offers the highest possible quality of work with ample space for yachts up to 80 tons. Precision Shipwright Services also offers work on location. With our mobile equipment and a custom-built paint cover we provide painting and fiberglass services on any location. We have already worked at several shipyards in Bangkok, Phuket and Hongkong.